I had the chance to review the Zeta level from Math-U-See. Math intimidates me so I’m always interested in resources to help me teach the various levels of math in our homeschool. And the best part? 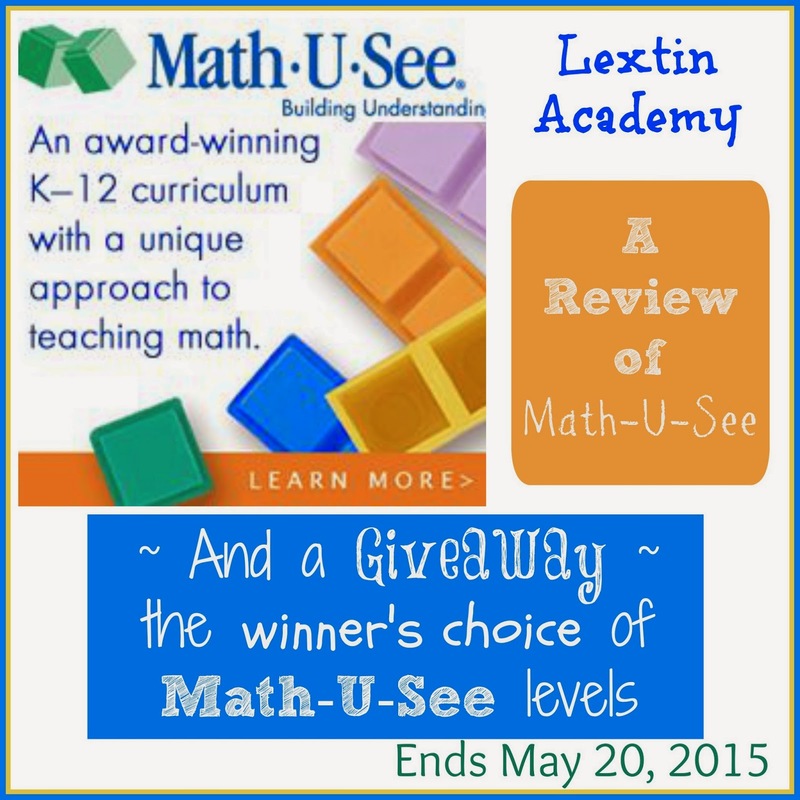 Math-U-See is generously allowing me to give away 1 level of Math-U-See. It’s the winner’s choice of levels for their homeschool! So, enjoy the review and be sure the enter the giveaway at the bottom of the page! One of my favorite things about Math-U-See is the people behind the company. I have to first begin with a little background info. 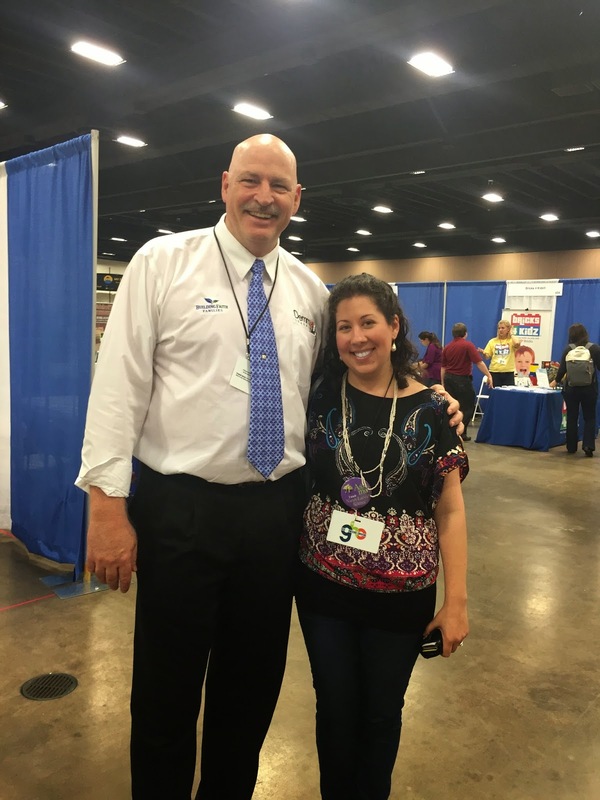 I had the chance to meet Steve Demme at a recent homeschool convention and we took a fun picture together. Y’all, I am one short little lady compared to him. Jolly math giant aside, he was fun and genuine and I enjoyed the chance to meet him. Through sharing that picture on Twitter, I was given the chance to review one level of Math-U-See and host a giveaway. Hooray! In the many emails back and forth with the marketing department, I mentioned that my daughter had recently broken her leg and a later date for the review would be best for me. When our Math-U-See box arrived it included a coffee mug, some hot tea packets, and stress balls for my poor little broken-legged child with a note wishing her a speedy recovery. That was such a nice surprise. Math-U-See is a complete math curriculum with levels spanning all grade levels from Kindergarten through high school. The program uses a multi-sensory approach to teaching with DVD’s, hands-on blocks, a teacher textbook, and worksheet pages. Math-U-See is a mastery-based math program to help a student understand a concept and then demonstrate mastery of that concept by teaching it back. The levels in the program do not correspond to grade levels and can be completed at the pace determined by a student’s understanding of the math concepts. I spent some time watching several of the DVD lessons before starting to teach them to Curly. I knew I needed a math brush-up. My husband heard all the math on the TV and he joined me. This became our nightly ritual. We watched the math DVD on the couch together. Steve Demme cracked us up! After watching the DVD many times on my own, I would watch it with Curly (usually more than once). Then I would teach her through the first practice page as we worked together. The extra practice was good for both of us so we were sure to cement a concept. That left two additional practice pages for Curly to work on her own. After that she would do one or two of the review pages and the enrichment page with word problems. Sometimes I had her sit with me as she worked the review pages and explain each problem as she went so she could teach it back to me and I could verify how well she understood the concept. I saved a few of the systematic review pages to sprinkle throughout the later weeks whenever I felt that we needed more review. Once we were done with most of the worksheet pages, I had Curly take the test so I could assess her understanding of the concepts. I was initially concerned about the mastery method for math. Curly is not very math-minded (and neither am I) and I know that we both need quite a bit of repetition for the math concepts to be remembered. Therefore, I had initially avoided programs that taught math for mastery because I was worried about a lack of review. However, I was pleasantly surprised to see the number of systematic review pages that are included in this program now. (I don’t think these were included in the original editions). These pages are incredibly helpful in our house! I find the DVD’s to be invaluable in teaching the lessons. Steve Demme explains the complicated concepts of decimals and place value much better than I could. And yes, the blocks really do help to visualize the math. When Steve Demme showed the 3-blocks made into a square with 3 up the side and 3 across the top, demonstrating that this represented “3 squared” with a total of 9 blocks making up the square my mind was blown. When you take a number and square it, it makes a square, an actual shape of a square. I always wondered why you “squared” a number. So, let’s just say that I “saw” a lot of math concepts explained that I had never before understood. Win! After playing around with this level of Math-U-See, I can say that I’ve been very pleasantly surprised with the teaching and with the new additions of extra practice pages and more word problems. The DVD’s are enjoyable to watch and we find ourselves laughing along with Steve Demme as he teaches math concepts. I have liked this program with the new changes so much that I’m trying to figure out how we can add it into our homeschool day. And now I want the other levels too…….. Giveaway open to US residents only. Winner will be selected at random by Rafflecopter and will have 48 hours to respond to email. I will verify the winning entry. If the winner does not respond within that timeframe, a new winner will be selected. The product offered is free of charge, no purchase necessary. Facebook, Twitter, and Pinterest are not affiliated with this giveaway. By providing your information on this form, you are providing your information to me and me alone. I do not share any information and will only use your information in order to contact the winner. The only Math U See that we have used is their Stewardship program, which we love! I would love to try the Gamma level with my son! I would love to win Alpha, Gamma or Delta levels. We are planning to use Math u see this year and would help a lot if we could win one. We would love to win the Alpha level! My son has autism, and hands-on is a wonder for him. Hi there! We would be blessed to win Beta. 🙂 Thank you for the nice review and giveaway. Mr. Steve (as we call him) is a TALL man! We would probably go with Beta. We have one guy really struggling with facts, but is fine with other concepts. I would love to win either Geometry or Zeta! What a blessing it would be to win this! (for all of them mamas I am sure…) We LOVE Math-U-See! Next year we'll need Primer, and two Deltas! Winning a Delta would be great! Math U See rescued one of my kids—math went from daily tears to daily smiles. 🙂 I would love to add Epsilon to our library, but I also need to purchase the Alpha workbook for my youngest. Looking forward to jumping into Primer this fall with my son, but I would request Alpha because I already have most of Primer bought. 🙂 Thanks for the giveaway! I would love to win Zeta! I have looked at this at convention but would love to try it. Probably Alpha. We have been using Math-u-see for 2 years for my oldest daughter, and I would love to get Primer for my younger one who will be starting Kindergarten next year. Alpha! We're just about to wrap up Primer, and we're extremely happy with the program. I would love to win one for my eldest who hates all maths. I would have to placement test him first. Thanks for the giveaway! If I'm picked, I'd love to have Beta :). We really need Geometry, thank you for the review and giveaway!! We loved Primer, would love the next level! Used Math U See with my 1st son years ago and would love to use Primer with my toddler. Thank you!!! Oh, I so need this! My oldest and I are about to finish the Gamma Level and I need the Delta Level but I can't afford it, so I really hope to win! My dd is almost done with Pre Algebra so Algebra would be next! I tried to say who I commented under but the space to write it wouldn't let me so hope it still counts. My name is under Linda. How fortuitous! I just realized that I needed at least the student workbooks for both Delta and Alpha next year. I sat down to order them, and found your review and giveaway on Google+. We love Math U See for the early grades around here. I've never used anything else! My son would place perfectly in Gamma. And I am in need of some hands on math for him next year also! This would be a big blessing to us. I would love to receive Alpha Level! Thanks for the chance to win! We have used Math U See from the very beginning and are about to start pre-algebra! I have also met Steve Demme and he is super! What many do not know is that he also has his own ministry. I'm intrigued, especially to give us a boost in our summer work. I'd have to decide between Primer and Beta. I would love to win Beta or Pre-Algebra. I have four kids who would be using the math, so any win would be a big help to me! I would love to win Alpha or Beta for my twins!! Thanks for the giveaway! I would love to win Gamma for my oldest son! Thanks for the giveaway. We will have a kindergartener next year and will start with the Alpha books. Good luck to everyone! We use this with both a 5th grader and 1st grader. Very good! Can't wait to win Zeta!! We used Primer and Alpha a few years ago. Unfortunately I misunderstood mastery of math facts to be the same as proficiency and speed so I burned out my son. I am thinking about trying again with both kids using Beta and Gamma.